I recently acquired a Taykit stove from fleabay. After much fiddling trying to get it to burn like my other two Taykit stoves, I decided there was a possible leak in the system. In the interest of Stovie science, I decided to disassemble the burner coil. I heated the base of the coils with a propane torch until the solder liquified and the coil tubing slid right out. 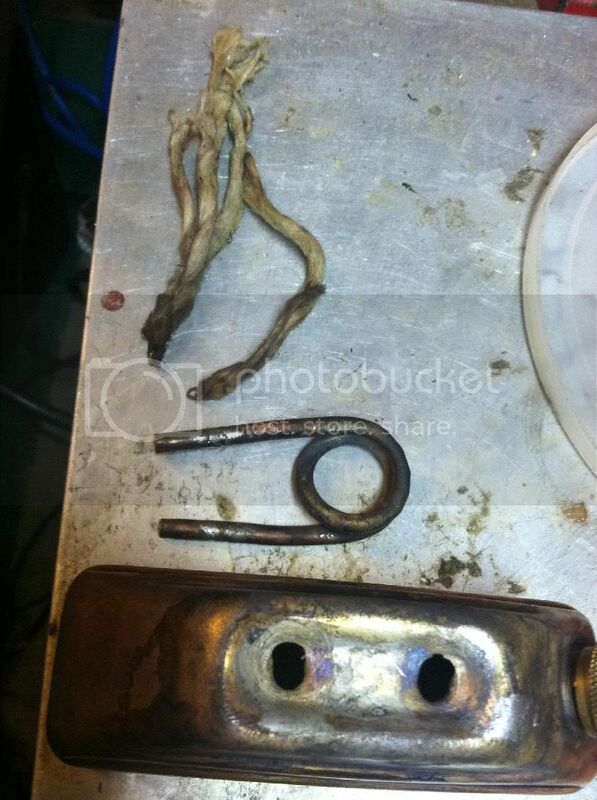 Here is a pic of the disassembled coil. I did lose some of the wicking strands on one side in the process. The wicks are folded in half with a small piece of wire twisted around the fold making it easier to insert in the tubes. They only go about a 1/2" into the tube. Once I locate some cotton mop strands, I will reassemble and solder into place. They only go about a 1/2" into the tube. Hey Ridgerunner, did you ever continue on with this project, find the mop and then re-thread the coil?